The history of Amalfi, on the southwestern coast of Italy near Naples, dates back to the 6th century. The small seaside town has a strong maritime and trading tradition, especially with Arab nations throughout the Mediterranean. 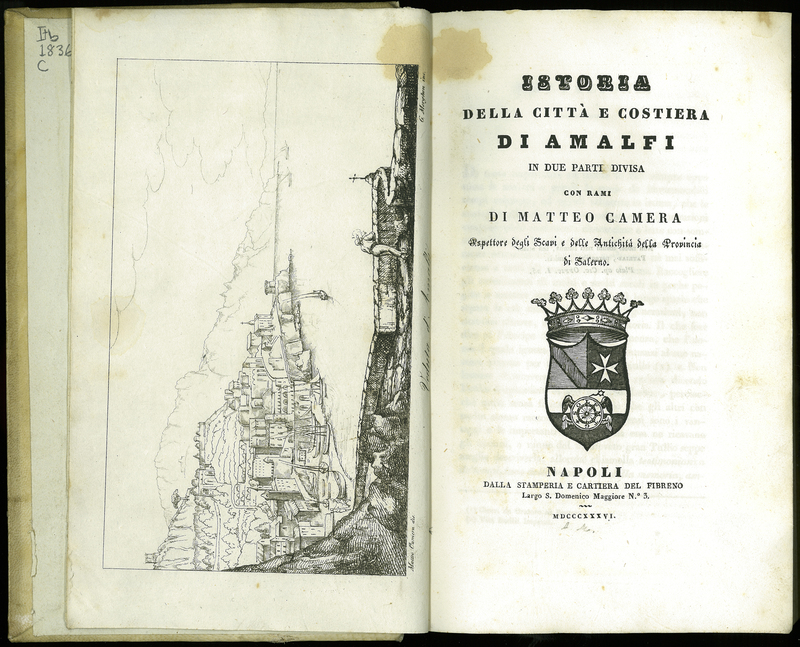 However, local historian Matteo Camera (1820-91) turned a blind eye to these Arabian connections in his 19th century seminal work, Istoria della Città e Costiera di Amalfi. Camera drew all the illustrations, including this landscape-oriented frontispiece. The images were then engraved by Guglielmo Morghen. The man leaning on the stone wall, puffing on his pipe, and looking towards Amalfi stands on what is now the site of the Hotel Santa Caterina. Matteo Camera, “Istoria della Città e Costiera di Amalfi,” ourheritage.ac.nz | OUR Heritage, accessed April 26, 2019, http://ourheritage.ac.nz/items/show/10701.